Now buy 10 pieces of KFC Hot & Crispy Wings for just Rs. 250 only. Note: This offer will be redeemed only after a bill of Rs. 300 has been made. Order Large Popcorn Chicken from KFC online order and get a superb deal of getting it at just Rs.150 only. This offer is valid on net purchase worth Rs 400 (excluding popcorn). Order the tender, juicy pieces of Hot & Crispy chicken with the extreme sprinkle, that you can pop non-stop. These little chicken popcorns are so tasty man... loved it. thanks for the coupon. We are glad to know that. Grabon always offers the best to its customers. Keep Visiting! KFC Wednesday Special Offer: Treat your taste buds to spicy, crunchy, juicy chicken offers and tasty delights. Grab Flat 44% OFF On 10 pieces Hot & Crispy Chicken combo for just Rs 500 which is valid only today. Offer valid till on Dine-in, Take Away, Delivery and online ordering and is not valid in Airport stores and Medicity Gurgaon. Delivery available in select stores and no Extra Taxes are applicable. Also, grab this wonderful wednesday special meal/combo put together for your friends and family. 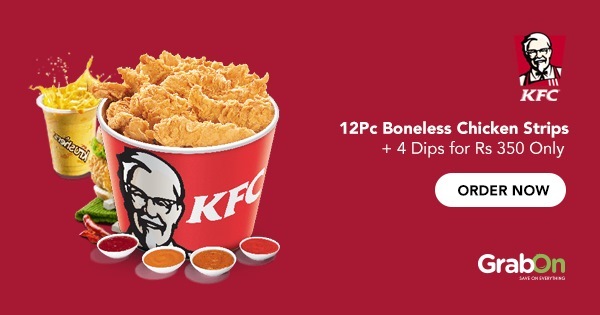 10 pieces Boneless Strips + 4 Dips + 10 pieces Hot Wings + Pepsi at just Rs 499 only. So hurry up and order now and take advantage of this deal as no special KFC Promo Code is required To get This deal. Order 6 Pcs Smoky Grilled Juicy Chicken marinated in a signature smoky sauce grilled to perfection at just Rs 445 only. This offer is valid only on delivery orders and cannot be redeemed for cash or clubbed with any other existing offer. No special KFC Promo Code is required to avail this offer. Follow the landing page to activate the offer and get the discount. Hurry Up and Order Today to enjoy your most favorite food from KFC online store. Get KFC's signature triple treat bucket where all three variants of chicken are included and can be ordered at a 38% discount. The bucket combo includes 4 Hot & Crispy with 6 Boneless Strips & 4 of Smoky Grilled pieces. Paytm Users, get this best deal of KFC and earn up to 100% cashback. Add your favorite food from the menu to the cart on the landing page. On the checkout page pay through Paytm wallet while making the transaction. Get up to 100% cashback (maximum cashback is Rs 60 per transaction). No minimum transaction amount is required to avail this Promo. Paytm cashback is applicable on maximum two transactions in a month. Coupon/Offer Details: Verified on 23 Apr 2019. Enjoy all new super saver offers on zinger burger, popcorn rice and duo combos starting from Rs 199. Valid in all cities and for all new and existing customers in web and app. KFC offers all that's good in the menu in one big meal box and called it "Friendship Bucket". 3pc Hot & Crispy + 3pc Hot Wings + 3pc Boneless Strips + Large popcorn in Bucket for just Rs 499 only. Follow the landing page and grab this deal without using any KFC Offer Code at the checkout page. Order the Friendship Bucket now and enjoy the classic combination with your friends. Hurry! Does a meal at KFC, Sounds Good to you!? Get to taste the lip-smacking Half n Half Meal from KFC. Enjoy the combo of KFC 4piece Hot & Crispy, 4piece Smoky Grilled, 4piece Hot Wings and 2 Pepsi cans at just ₹599 Only. KFC Offer Today: Buy 4pc Hot & Crispy Chicken Wings now @ just Rs 120 only. These Chicken wings are smeared with Lemon Chilli Flavour, that makes it so hard to resist with just 4. Follow the landing page and order the Hot & Crispy Chicken Wings by adding it to the cart. Click on GET DEAL to activate the deal as there is no need of KFC Promo Code to avail this offer. Hurry up and order now and get the deal today! KFC introduces The Best Wednesday Offer, the special combo meal newly introduced in the menu. Grab 10 pieces Hot & Crispy Chicken + 6 pieces Boneless Strips + 2 Pepsi Cans at just ₹559 only. KFC is offering a blockbuster deal for all new and old users. Now grab 2pcs Hot and Crispy Chicken for just Rs 110. This is a limited exclusive offer and cannot be clubbed with existing offers. There is no need for any KFC Coupons Code to avail the exclusive deal. Follow the landing page and add Hot and Crispy Chicken now. A complete meal at just Rs 239. Tap on GET DEAL and follow the landing page to order Tender, Crispy and Juicy Boneless Chicken Strips. Grab yourself this unique treat for just Rs 205 only (inclusive of all taxes). Add the Boneless Chicken Strips from the menu to the checkout cart and order today online. There is absolutely no need for any special KFC discount coupon code to get the deal. Order this exclusive and fabulous 5 in 1 Double Trouble Box for just Rs 209. This box includes 1 Double Trouble Burger, 1pc Veg Strip, 1 Pillsbury Cookie Cake, 2pc Hot Wings and 1 Pepsi Can. Follow the landing page and order the Double Trouble Box now. No Special Coupon Code needed to avail this deal. Buy the Wednesday Double Trouble Burger at Flat Rs 209 inclusive of all taxes, valid for all new and existing users. KFC Brings The Joy Of Classy KFC Triple Treat Menu and to top it up, makes sure that you save 40% on it. Enjoy 4 pieces Hot & Crispy, 4pieces Smoky Grilled And 6pieces Boneless Strips in your menu just for ₹649 only. Hurry Up & Order Now to grab this deal and satisfy your hunger with this KFC meal and save on your budget. Never had you seen an offer like this. Order 8 pieces of Smoky Grilled Chicken for just ₹570 only. Get this KFC Bucket Meal at Flat ₹570 only inclusive of all charges and taxes. Because nothing should ever come in between you and food when you are hungry and even when you are not. We at GrabOn provide you with the best offers at KFC. You can get your hands on KFC special offers along with KFC daily offers and discounts on your favorite food, be it burgers or fries. Whether you are craving for the KFC bucket, Zinger burgers or a Krusher to beat the heat. Now you don’t have to be content with a little because we make sure you get more for less every time you visit our website. Hurry up! Go gorge on your favorite food item! Kentucky Fried Chicken or KFC as we know it is the world's second-largest fast-food chain with regards to the sales. It had its genesis on the roads of Korby, Kentucky. Harland Sanders was the first to recognize the scope of this fast food franchising concept, first one being in Utah. Since that happened, KFC has satisfied the taste buds of millions of people worldwide with amazing offers like KFC Friday offer. With more than 350 outlets in India KFC has its wings spread in almost all parts of the second most populous nation - India. Giving way to KFC coupons India so that you can enjoy the deliciousness of KFC today and every other day with coupons like KFC Tuesday offer. Go to GrabOn.in type in KFC in the search bar and press enter. Click on ‘Show Coupon Code’ or ‘Activate Offer’ next to the best deal you see. Select your choice of hot wings, chicken strips, burgers, rice bowls, snacks; apply the discount code at checkout page while placing the order. If you feel a little lost on Wednesdays, then you are not alone. It’s not the weekend yet and the work week has been on for two days and when the mid-week crisis hits, it hits you hard. With tons of work piling up on your desk and even more getting done on deadline, you will be spending more time at work. What better than some late night munchies or a scrumptious lunch? KFC Wednesday offer bucket is definitely something you should be looking out for. The Wednesday offer in KFC is something that should never be missed. It is guaranteed to liven up your day and throw in some much-needed delight amid the busy schedule. Check out the KFC Wednesday offer menu and indulge yourself a little, because you deserve it. As Tom Haverford and Donna Meagle from Pawnee Parks & Recreation department would say, ‘Treat Yo Self’! With KFC Wednesday offer to get bucket with delicious mouthwatering smoky grilled chicken or crispy chicken wings and more. KFC boasts of being the best-fried chicken serving outlet you will ever come across. The KFC bucket that they serve is simply out of this world. Also, their trademark Zingers and Krushers are an all-time favorite with all the foodies. More additions are being made from time to time. And thanks to the KFC offer of the day you can get all the yummy food at a great price. This place makes sure one gets nothing but the best every-time one walks in. The best part of KFC is its affordable pricing and the rest of the weekday offers like KFC Friday offer. That being said, anybody can satisfy their hunger with the most tantalizing menu that KFC offers. From Chennai to Hyderabad and Bangalore all the way to Kolkata, KFC Wednesday offer with bucket is something that everyone loves. Check out the KFC Wednesday offer, Chennai, for the latest and best KFC coupons in the state. KFC Wednesday offer Bangalore provides the best deals on chicken burgers, crushers and cold drinks from the said store. The city of Nizams is famous not only for its biryani and pearls, now the netizens can enjoy the finger-licking goodness with KFC Wednesday offer Hyderabad. People swear by the Hyderabadi biryani and the haleem but now they can enjoy KFC offers at Hyderabad. If you’re from the city of Joy just, things just got a little bit happier with the KFC Wednesday offer Kolkata wherein you can sample amazing tastes at jaw-dropping prices. KFC is known for its delicious chicken wings that everyone loves and not to mention the mouthwatering offers at KFC. They make sure that what they serve is completely hygienic not just appetizing. True to their tagline their food is “Soo...Good”. And KFC makes sure nothing ever comes in between you and your palate. They stand second to none when it comes to delight your taste buds with a variety of chicken as well as vegetarian dishes. How To Use KFC Coupons On GrabOn? Suffering from hunger pangs but too lazy to cook? Well, you need not wonder anymore about what to eat. Get your snack on with KFC daily offers. Whether it is a Sunday or Monday, you can avail deals such as KFC Sunday offer and eat something your taste buds will approve of and at the same time will fill up your stomach. KFC is the answer to all your woes. If you are over the top hungry there’s a KFC bucket offer. If you are just bored and hungry there are KFC daily offers. KFC offers lip-smacking burgers and chicken snacks that are prepared southern style. This southern style chicken concept is a secret blend of 11 herbs and spices. KFC, being one of the world’s biggest series of fast-food restaurants, gives its customers the taste of southern spice chicken meals effortlessly. KFC offers the same finger-lickin' good taste every time you visit the fast food joint. Explore the finest quality of finger-lickin' fast food. Chefs at KFC tirelessly put their full-time adventure in offering you the best spicy bucket. If you are ordering in, look for KFC online offers like KFC Thursday offers, and if you are going overlook for KFC offer of the day. Also, don’t forget to look for KFC special offers with GrabOn. You don’t have to wait till Tuesday to redeem your KFC Tuesday offer, just order any day and use our KFC coupon codes to avail great discounts.